AH, THOSE “GOOD OLD DAYS”…. 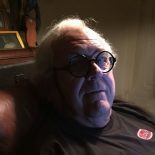 TWO RECENT HAPPENINGS remind me that those “good old days,” the Fifties and early Sixties, were hardly the stress-free idylls nostalgically recalled. Nor am I talking about misogyny and racism. I’m talking about The Bomb. Take Cover! I recall my generation herded into school basements, aligned into neat rows, and crouched on one knee, arms protectively folded over our little heads. 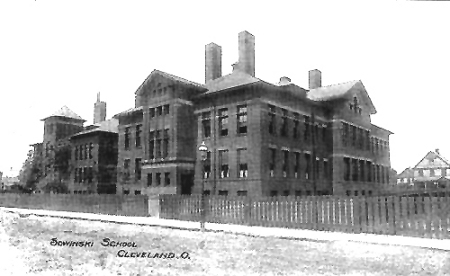 Sowinski Elementary School, Cleveland, Ohio. Image by John Vuchinish at classmates.com. We didn’t ponder, I forget why now, the potentially collapsing four stories of brick schoolhouse above us. I do recall imagining what neat little piles of cinders would be discovered years later, once our Cleveland neighborhood (near major industry) wasn’t still hot radioactively. BLARING SIRENS. Carefully orchestrated siren alerts would let us know that Russian bombers were almost here with their atomic weaponry. We knew the sirens sound because of periodic tests of the civil defense system. One suggestion of the era: “Stay off your telephone!” This is still timely advice, with today’s admonitions to avoid clogging cellphone circuits during an emergency. By the way, according to Scientific American, it’s better to text than call during a mass emergency. Texting uses a different protocol and occupies less bandwidth than chatter. That old PSA also mentioned the importance of CONELRAD, Control of Electromagnetic Radiation. The CONELRAD logo included the shield of the Federal Civil Defense Administration. CONELRAD. 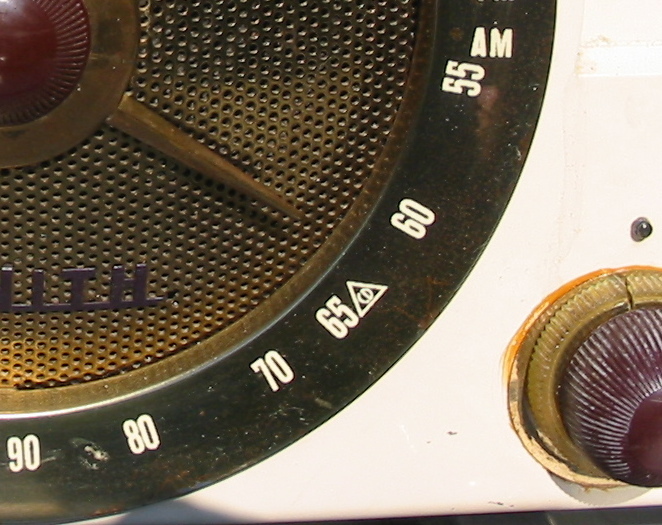 I remember CONELRAD from the two little symbols at 640 and 1240 on the analog tuning face of AM radios. Established by President Harry S Truman in 1951, CONELRAD lasted until mid-1963. It was part of the Federal Civil Defense Administration, a precursor of today’s Department of Homeland Security and its Federal Emergency Management Agency. 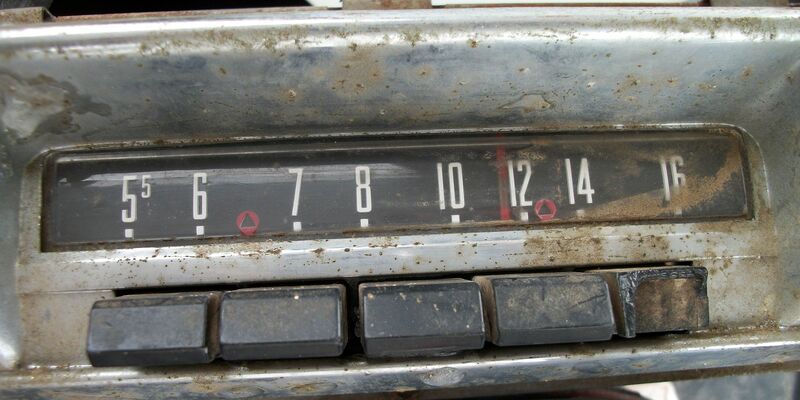 Above, an AM radio dial and its CONELRAD locator. Below, car radio buttons discovered by Feddecheenee. These days, to me this is scarier than hunkering down in the Sowinski School basement. And Then There was The Bomb. I recently read an article by Dwight Garnet in The New York Times, March 11, 2019, about Lawrence Ferlinghetti. 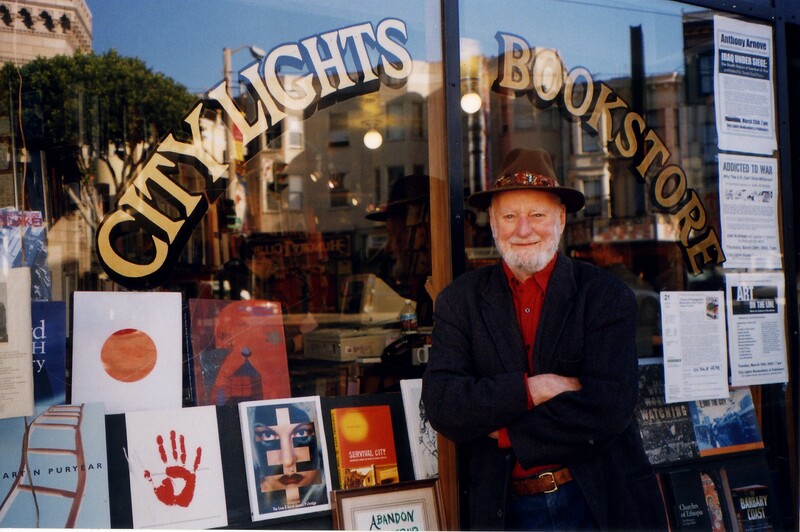 Ferlinghetti, turning 100 this month, is a poet, publisher, painter, social activist, and owner of City Lights, the San Francisco bookstore he co-founded in 1953. He’s also something of a beatnik mentor of mine. Lawrence Ferlinghetti in front of his bookshop, c. 2015. Image by Stacey Lewis. Ferlinghetti got me thinking of another mentor of the era, poet Gregory Corso and his poem Bomb, 1958. 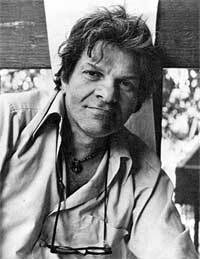 Gregory Nunzio Corso, 1930–2001, American poet of the Beat Generation. This entry was posted on March 27, 2019 by simanaitissays in And Furthermore... and tagged "Bomb" Gregory Corso, "Turtles exploding over Istanbul" -- Corso's "Bomb", atomic bomb drills, CONELRAD alerts, Lawrence Ferlinghetti City Lights bookstore, Sowinski School Cleveland, text not cell call during mass emergency.